It takes approximately 10 thousand years for coral polyps to form a reef, and between 100,000 and 30 million years for a fully mature reef to form. Differences in exposure to wave patterns create a variety of habitat types. 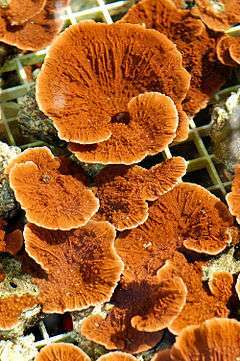 The coral need a mutualistic symbiotic relationship with zooxanthellae algae in order to build a reef. The ocean water contains relatively little beneficial nutrients that the coral can utilize. The single celled algae derive their nutrients by using photosynthesis, and the coral provide shelter to the algae in return for some of the nutrients. Coral receive their vibrant colors from the different species of zooxanthellae that inhabit them. Zooxanthellae populations can die with changing environmental conditions, causing the coral to lose color, known as coral bleaching. Coral reefs provide a variety of services to humans and other species. These include providing habitat for fish and other marine species, destination sites for marine tourism, grounds for subsistence, recreational and commercial fisheries, medicinal substances and shoreline protection from storms. The coral reef ecosystem provides habitat to over 9 million species covering approximately one fourth of marine life. Its three dimensional structure provides hiding places for fish, shrimp and clams. Coral itself is consumed by species such as parrotfish. It provides a hunting ground for predators. Coral reefs houses plants and animals that produce chemical compounds that have found use in human medicines. As early as the 14th century, the medicinal properties of coral reef dwelling species were utilized. Antiviral extracts and tonics continue to be studied and toxic compounds such as neurotoxins discovered in coral reefs have proven beneficial as painkillers. The limestone skeleton of coral has been tested and used for human bone grafts, due to its porous nature and has a lower rate of rejection than artificial bone graft materials. There are three main categories of interest the public should have for the preservation of coral reefs: the preservation of natural beauty and value, the promotion of the local economy, and long-term scientific goals. Over one-third of marine species call coral reefs their home. This creates a beautiful underwater experience for snorkelers and divers. This great genetic biodiversity has a lot of potential for industries like pharmaceutics, biochemistry, and cosmetics. This biodiversity also boosts the economy through an increase in marine tourism and commercial fisheries. Long-term, coral reefs have been recognized as large contributors to the absorption of carbon dioxide emissions which has been an important part of the mitigation of climate change. Two types of stressors are associated with reef systems: natural and human-induced. The effects of these stressors can range from negligible to catastrophic. 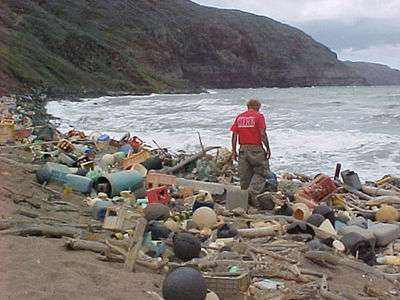 Debris on the coast of Hawaii. The warming waters, ocean pH changes and sealevel rise associated with climate change operate on a global basis. Localized examples include residential, developmental, agricultural and industrial runoff, sedimentation from land clearing, human sewage and toxic discharges. Acute stressors can inflict other damage, via unsustainable fishing practices, boat anchors or accidental groundings. Some fishing practices are destructive to reef habitats, such as bottom trawling, dynamite fishing and cyanide fishing. Ghost fishing (unintended damage from abandoned fishing equipment) harms many coral reefs. Even small-scale fishing can damage reefs if herbivores are not removed and thereby not allowed to protect reefs from encroachment by algae. Boaters can damage coral by dropping their anchors on reefs instead of sand. Accidental boat groundings can obliterate areas of coral reef. Lettuce corals and branching corals such as elkhorn and finger coral are fragile, but even massive boulder corals can be crushed or broken and turned upside down to die by a sailboat keel. Groundings in sand, or even the churning action of propellers, can cause major localized siltation, indirectly killing adjacent corals. Sediment pollution from land has severe consequences for coral reef ecosystems. However, even along one coastline, separate reefs can experience different water flow conditions that affect sediment distribution. A 2015 study assessed sediment from two streambeds less than a mile apart on the island of Lānaʻi, Hawaii. One site experienced quick-moving currents that efficiently flushed away sediment, protecting the reef, while the other was subjected to currents and wave conditions that allowed sediment to be continuously re-suspended in the water, starving the reef of light. The vast biodiversity of coral reefs consequently create an abundant fishing area for locals. This leads to overfishing of reef herbivore organisms which makes the coral reefs more vulnerable and unable to recover from large environmental disturbances. Unfortunately, most marine ecologists expect future oceans to be more overfished than now. It is difficult to create a substantial plan for the protection of coral reefs due to their location out in open water; there is no distinct ownership over certain parts of the ocean, which creates difficulty in delegating responsibility. But private and government groups whose purpose is to help the environment have made steps towards the restoration of coral reefs. The aim of coral restoration is to help coral adapt to stressors and changing environments. NOAA's Coral Reef Conservation Program and Damage Assessment, Remediation and Restoration Program approaches restoration by responding to and restoring physically damaged reefs, preventing the loss of habitat, implementing coral conservation projects, focusing on restoring endangered coral species and controlling invasive species. The Coral Restoration Foundation has restored over 100 genotypes of staghorn corals (Acropora cervicornis) using coral nurseries, and also has research goals of determining ecological success, ideal restoration locations and how surrounding organisms affect restoration. Sediment flux can be reduced in steep watersheds on montane tropical islands in the Hawaiian archipelago by restoring vegetation and controlling invasive species. Gabions — check dams — created by planting normally invasive kiawe trees by a local community group, stopped 77 tons of sediment from flowing into the ocean that would have needed about five weeks of natural water flow to flush from the reef. Coral aquaculture, the process of using coral nurseries to restore the world's reefs is a project that is capable of improving biodiversity, structural integrity and coral cover. Coral nurseries can provide young corals for transplantation to rehabilitate areas of reef decline or physical damaged. In this process, coral gametes are harvested from spawning grounds and grown in a laboratory environment, then replanted when they grow larger. This allows the coral to grow safely in controlled amounts under lab conditions. Nurseries can begin as small patches of rescued coral colonies, and may be salvaged and restored before transplantation. In 2009, The Nature Conservancy began to grow over 30,000 young coral in underwater nurseries in Florida and the Caribbean for transplantation. Marine Protected Areas (MPAs) have become an increasingly prominent tool for reef management. MPAs promote responsible fishery management and habitat protection. Much like national parks and wildlife refuges, and to varying degrees, MPAs restrict potentially damaging activities. MPAs encompass both social and biological objectives, including reef restoration, aesthetics, biodiversity and economic activity. MPAs have not been universally accepted. Conflicts relate to lack of participation, clashing views, effectiveness and funding. Many MPAs offer inadequate protection for coral reefs. Only 27% of coral reefs are in MPAs globally. Only 15% of MPA sites were considered effective, with 38% partially effective and 47% ineffective. This leaves only 6% of coral reefs in effectively managed MPAs. In some situations, as in Kiribati's Phoenix Islands Protected Area, MPAs provide revenue that is potentially equal to the income they would have generated without controls. Biosphere reserve, marine park, national monument and world heritage status can protect reefs. For example, Belize's Barrier reef, Chagos archipelago, Sian Ka'an, the Galapagos islands, Great Barrier Reef, Henderson Island, Palau and Papahānaumokuākea Marine National Monument are world heritage sites. The Parcel de Manuel Luís Marine State Park protects the largest coral reef in the South Atlantic. This became a Ramsar Site in February 2000. In Australia, the Great Barrier Reef is protected by the Great Barrier Reef Marine Park Authority, and is the subject of much legislation, including a biodiversity action plan. Inhabitants of Ahus Island, Manus Province, Papua New Guinea, have followed a generations-old practice of restricting fishing in six areas of their reef lagoon. Their cultural traditions allow line fishing, but not net or spear fishing. The result is both the biomass and individual fish sizes are significantly larger than in places where fishing is unrestricted. ↑ "Coral Reefs". National Fish and Wildlife Foundation. 1 2 "Stanford : Types of Reefs". ↑ "Stanford : Reef Structure". 1 2 "Coral Reef Alliance". ↑ Done, Terry (2004). "Coral Reef Protection". Issues In Science & Technology. 20.3: 14–16 – via Academic Search Complete. ↑ Caillaud, Anne (2012). "Preventing Coral Grief: A Comparison Of Australian And French Coral Reef Protection Strategies In A Changing Climate". Sustainable Development Law & Policy. 12.2: 26–64 – via Academic Search Complete. ↑ Wagner, D. E.; Kramer, P.; Van Woesik, R. (2010). "Species composition, habitat, and water quality influence coral bleaching in southern Florida". Marine Ecology Progress Series. 408: 65. doi:10.3354/meps08584. ↑ "WWF - Fishing problems: Destructive fishing practices". WWF Global. Retrieved 23 April 2015. ↑ Bartels, Paul. "Fragile reefs: handle with care." Cruising World 22.n1 (Jan 1996). 15 Oct. 2009 . ↑ "Gale - Enter Product Login". 1 2 "Study clears the waters on a dirty threat to Hawai'i's reefs –...". Human Nature – Conservation International Blog. Retrieved 2016-02-21. ↑ Rasher, Douglas (2012). "Effects of Herbivory, Nutrients, And Reef Protection On Algal Proliferation And Coral Growth On A Tropical Reef". Oecologia. 169.1: 187–198 – via Academic Search Complete. 1 2 Lowe, Phillip (2011). "Empirical Models Of Transitions Between Coral Reef States: Effects of Region, Protection, and Environmental Change". Plos ONE. 6.11: 1–15 – via Academic Search Complete. ↑ Gateño, D. "Aquarium Maintenance of Reef Octocorals Raised from Field Collected Larvae". ↑ "Reefs at Risk Revisited" (PDF). World Resources Institute. February 2011. Retrieved March 16, 2012. ↑ Cinner, Joshua E.; MARNANE, Michael J.; McClanahan, Tim R. (2005). "Conservation and community benefits from traditional coral reef management at Ahus Island, Papua New Guinea". Conservation Biology. 19 (6): 1714–1723. doi:10.1111/j.1523-1739.2005.00209.x-i1. ↑ "Coral Reef Management, Papua New Guinea". Nasa's Earth Observatory. Retrieved 2 November 2006. Maui Coral Reef Recovery Team (2012). "Maui Coral Reef Recovery Plan" (PDF). mnmrc.org. Maui Nui Marine Resource Council. Retrieved 2016-02-21.